In our “Putting People First” post, we introduced North Carolina State University’s Department of Parks, Recreation and Tourism Management and People-First Tourism (P1t), Inc., the first tech-based social startup to spin off from N.C. State. The university’s spinoff and its P1tLab are leading one of the world’s most innovative efforts to foster experiential tourism environments. 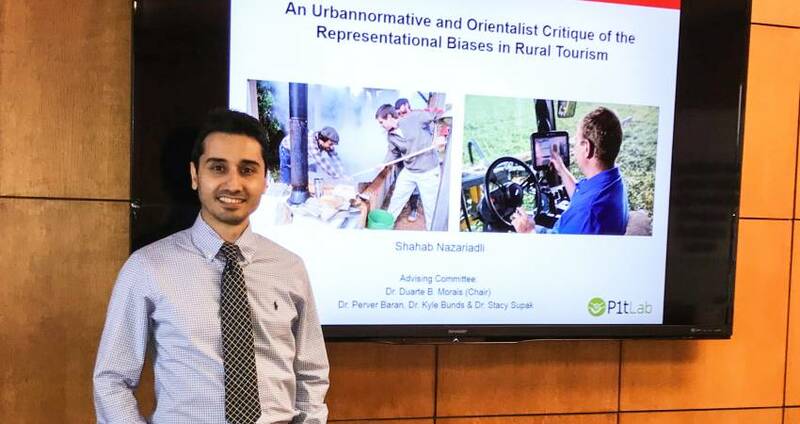 For this post, we interviewed Dr. Shahab Nazariadli, a May graduate of N.C. State who worked at the P1tLab from 2014 to 2018, discussing these tourism innovations that are emerging in our own backyard as well as a few broader concepts of equitable/sustainable tourism. What is the P1tLab? Is it an actual place, a group of likeminded people, a bigger network? P1tLab is a global network of teams of scholars pursuing research on tourism microentrepreneurship through Participatory Action Research. P1tLab is a product of North Carolina State University, Department of Parks, Recreation and Tourism Management. P1tLab at N.C. State leverages the work and insight of an eclectic group of committed faculty and students from a global network of university tourism programs (e.g., Ritsumeikan Asia Pacific University in Japan and The University of South Pacific in Fiji) pursuing related but independent research agendas. The project also involves the endorsement, expertise and work of partners in target communities. We share our endorsement of the P1t Manifesto, we share our commitment to Participatory Action Research best practices, and we collaborate on writing technical publications and funding proposals. Why did you choose N.C. State and the P1t program for your studies? How are they different from other academic settings? I had my background in architecture and landscape architecture; despite being proficient in architectural design, diagraming and rendering, I knew I was missing insights of human behavior and the social sciences. Stemming from my master’s thesis research and the design of an open-air museum (i.e., museum without walls), I started challenging myself to architect for people and the good of communities rather than practicing mastery of design skills and sculpturing. Next, I began networking through the Tourism Research Information Network (TRINET), getting advice from tourism academics around the world as well as becoming updated about the most advanced trends and dialogues in tourism. By receiving advice from a couple of academics in the TRINET, I became acquainted with the P1t project at N.C. State, as a singular project that puts people first and at the core of their decision-making. Dr. Morais, the founder of the P1tLab, believed in the transfer of knowledge into practice, which elevates equitable and sustainable tourism in under-resourced communities. This vision and the close partnership with local agents and record of positive impacts upon local communities nicely intersected my philosophy of altruism and academic needs. This is how I found my second home at the P1tLab and found myself collaborating with a couple of highly passionate and devoted researchers at N.C. State. What were your own research interests when pursuing your doctorate here? What tools do you use to research our area? My research interests hover around tourism microentrepreneurship, rural tourism, urban tourism, architecture and tourism and application of visual research methods in tourism. I assume my inclination in leveraging visual prompts in research was twofold: my better understanding of the world through visuals, as well as the central role of visuals in tourism promotion and developments. Nowadays, with the advancement of technology, new research tools are being introduced into the research market, not only accelerating the research process but also escalating its validity and reliability. For example, I created the Visual Q Method (VQMethod) online research tool in Dec. 2017, which has become a pioneer website in video and audio and image sorting methods. This tool has been massively used and has grown organically through its use by product developers and researchers around the world. Another tool I utilized was immersive virtual reality (IVR) to envelop research informants in simulated environments and elicit close-to-real responses. In one instance, I brought the IVR equipment (consisting of goggles and an Xbox controller) to the Midtown Farmers Market, asking volunteer visitors to click on elements of agricultural environments which seemed appealing to them. That experience was highly rewarding and uncommon, by setting up the lab conditions in a farmers’ market setting and approaching people instead of bringing them into an experiment lab. How are people in Wake County and across North Carolina benefitting from the work that you and your colleagues have been doing? At P1tLab we tried our best to maximize benefits for local communities through each piece of research and action. The research we conduct is participatory and action-oriented, which is looked upon as a process that concludes with valuable outcomes and actionable information for communities. The process involves the community in an empowering process to gradually gain agency and self-determination. Their input and contributions even have the potential to change the research design and orientation, because of our continuous cumulative learning and insight from participant individuals. We have also regularly informed the communities and stakeholders throughout post-research publications, conferencing, fact sheets, videos and blog posts to raise awareness and convey the know-hows of betterment. Another parameter guiding our research at P1tLab is to base the research on long-term partnerships with participants so as to allow access to data longitudinally and yield stronger inference scholarship on the impact of tourism microentrepreneurship on the participants’ lives, natural environments and communities. Why is it important to nurture microentrepreneurs in the realm of tourism? Microentrepreneurship is a mechanism that can engage alienated segments of the host community in making income from tourism, because it is under-regulated and outside the sphere of influence of the formal industry. Microentrepreneurship is not as susceptible to the control of tourism tycoons, because it is unscripted, requires low investment capital and does not need to be integrated in formal distribution systems. Microentrepreneurship is the most meaningful and impactful way for locals to get involved in the tourism industry. Moreover, the sense of ownership of a tourism business is seen as a central tenet to self-reliant and self-determined development of the individual and the community as well as his or her involvement in decisions that affect the industry in the community. What kinds of things can all of the hospitality businesses in our county and even the Greater Raleigh CVB learn from P1t’s research? To foster livelihoods, equal prosperity and hope among our community’s citizens, our hospitality businesses would need to promote inclusiveness by respecting and integrating local peoples’ knowledge and participation into their multilayered operations. The local people are gems in the overall success and preservation of local sociocultural assets. They could partner with and/or fund university projects that would potentially enhance their community-friendliness, inclusiveness and reputation. Besides, the hospitality businesses can support the existence and sustainability of small, local businesses that serve in tourism industry through innovative methods (such as our Fork to Farmer venture, ultimately increasing local farm visits, diversifying income for the farmers and boosting rural agritourism). Do you think it is vital to preserve the rural parts of Wake County while the area is also becoming more urban? In my opinion, the answer is dependent on how we interpret urban and rural. From the U.S. Census we can see that rural is defined as everything that is not urban, while in the modern era, the boundaries between urban and rural are vanishing. This is how the world tends to grow. Nowadays, the differences between urban and rural are often based in sociocultural and political aspects. But, it should not be ignored that people in our rural regions are very smart, ambitious, think innovatively and value progress and prosperity. Blending them into the urban systems would be highly advantageous for urban-centered businesses, while their displacement is harmful for rural regions. Their integration into tourism policy-making and developments would be highly beneficial for the support, sustainable growth and profit-making of tourism businesses too. In one of the interviews I conducted with a local farmer during my research, she emphasized that we need to teach our children where food comes from and how hard is to produce “cosmetically perfect” food. The closeness of farms to our urban regions encourages our children to become more familiar with processes of food production, as well as to find a space to unwind and relax, be creative and get away from the jungle of concrete buildings. Moreover, tourists also like the dynamics of urban and rural and the contrasts, while finding more cultural values in rural regions.